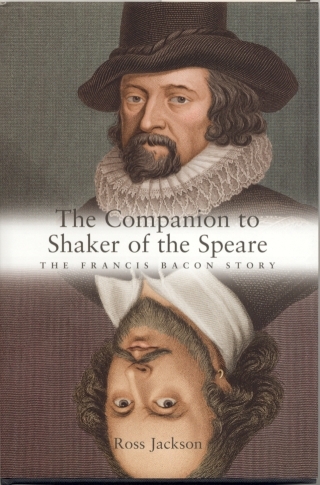 This Companion complements my novel, Shaker of the Speare; The Francis Bacon Story, by documenting the storyline chapter by chapter. This slightly unorthodox procedure was followed due to the controversial nature and historical importance of the story. After all, who wrote what is generally considered the greatest piece of English literature is of major literary importance. The Companion provides those who are interested in the authenticity of the novel’s storyline with considerable material to assist in making a personal judgement. I made a great effort in the novel not to write a single line that can be proven false. This will surprise many because the story is not the one people are used to hearing, neither concerning Francis Bacon, nor concerning William Shakespeare. Nevertheless, the story may well be as close as we are ever likely to get to the truth of what really happened. Anyone in doubt of this claim should study The Companion and its references carefully. There are good, logical reasons why the true story was suppressed and why many events were misinterpreted by historians. A further reason for the publication of this Companion is to enable the reader to distinguish between documentable facts and literary license, i.e what parts of the novel are fictionalised for the sake of the literary flow, and which parts are known to be authentic. In fact, all the major events are authentic. The fictionalise parts are relatively few and are generally identified as such where they occur. Even some of the dialogue is authentic. It should be noted that the evidence put forward here is by no means original. My task has been to sort through the enormous amount of material made available on these issues by an army of researchers and historians, and to make sense of it all. The Companion is best read in conjunction with the novel, but it can be read independently by those whose main interest is to judge for themselves the validity of the events described in the novel regarding Francis Bacon’s life, in particular his authorship of the Shakespeare works. Others will find interesting evidence regarding other controversial matters which differ in some respects from the generally accepted historical view. For example, concerning Bacon’s role as son of Queen Elizabeth, his relationship to Robert Lord Essex, the events surrounding his political demise as chief minister of King James, and his roles in founding Rosicrucianism, in the colonisation of America and in the editing of the King James Bible.